It has been one year since Syrian-Palestinian open technology leader Bassel Khartabil disappeared from his prison cell in Syria. 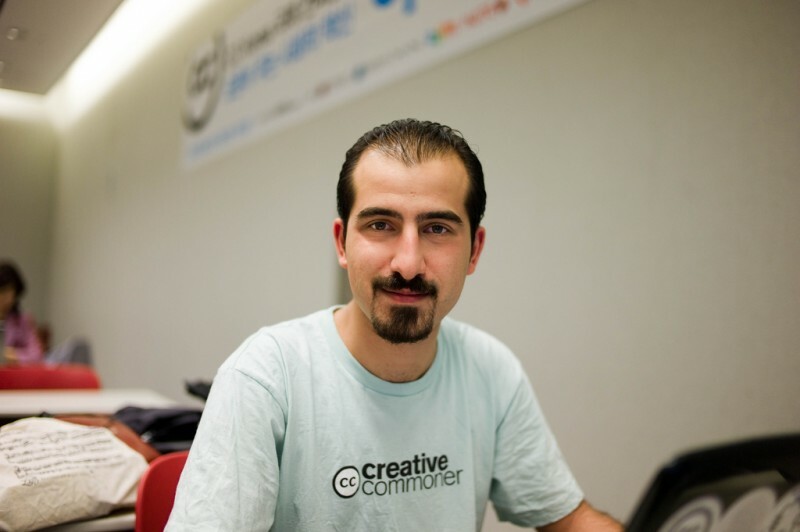 Bassel served as the public affiliate for Creative Commons Syria and contributed to Mozilla Firefox, Wikipedia, and other open communities online. He also was the CTO of Al-Aous, a publishing and research institution dedicated to archaeological sciences and arts in Syria. In November 2012, Foreign Policy named Bassel one of the world's 100 top global thinkers. Bassel is credited with opening up the Syrian Internet and extending online access to the public before and during the 2011-12 uprisings. According to the European Parliament, his detention was part of Syrian government efforts to restrict access to online communities and stifle freedom of expression in the country. While he has been in the custody of Syrian government authorities since March 2012, he has been unaccounted for since October 2015, when he was taken from Adra prison to an undisclosed location. A month later, his wife, Noura Ghazi, received a phone call from an unidentified source telling her that her husband had been sentenced to death. She has received no information about him since. This past week, Ghazi wrote in a public post on Facebook that she is beginning to lose hope that her husband is still alive. Among other recent anniversaries that no one wants to celebrate, October 4 marked the eighth anniversary of Iranian technologist and open source developer Saeed Malekpour’s arrest. Malekpour was living in Canada as a permanent resident before he embarked on what was supposed to be a short trip to Iran in October 2008, to visit his father. Authorities took the opportunity to target Malekpour for his open source software program, a simple tool that helps upload images to the Internet. Others had used Malkepour’s code to upload pornographic images to the Internet. In a trial that reportedly lasted 15 minutes, Malekpour testified that he did not know how his program and code had been used and developed by others, as it was distributed on GitHub, an open source code repository. Malekpour was sentenced to death as a “corrupter of the earth.” In December of 2012, Malekpour's death sentence was commuted from death to life in prison, where he remains today. Global Voices publicly condemns these unjust prison sentences and joins supporters around the world in demanding information on Bassel Khartabil’s status. We urge readers to visit support websites for Saeed and Bassel. Nigerian authorities have detained at least 11 journalists, bloggers and media support staff last week, according to reports from the Committee to Protect Journalists. Ten of the journalists worked for the independent news website Watchdog Media News, and were in the southern Nigerian state of Edo to cover gubernatorial elections. They were reportedly beaten with barbed wire by the State Security Service at the time of their arrest. Another journalist, Jamil Mabai, was arrested in the neighboring state of Katsina after criticizing the governor on social media. Ethiopian blogger Seyoum Teshome was arrested on October 1, and is being held on unknown charges. Teshome is frequently quoted in international media commenting on affairs in Ethiopia, including in a recent New York Times article on the symbolic protest at the Rio Olympics by Ethiopian marathon runner Feyisa Lilesa. Teshome’s arrest comes at a volatile moment in Ethiopia: the day after his arrest 52 people were killed during a protest in Oromia after police fired tear gas and rubber bullets into the crowd, causing a stampede. The protesters are fighting against the marginalization of Ethiopia’s Oromo ethnic group, which could be displaced under a planned expansion of the Ethiopian capital into the region. Since November 2015, human rights groups have documented nearly 600 killings of protesters. Five Tanzanian citizens were charged with insulting President John Magafuli on social media. Several of the five citizens are accused of allegedly posting messages on social networks and in private WhatsApp groups critical of the president, an indication that expressing political opinions online in Tanzania is under increasing scrutiny by the government. Amid all the gloom and doom of this week's edition, there is some light ahead. The encrypted mobile messaging app Signal received its first federal grand jury subpoena for a customer’s data this year, but only shared limited information with the FBI. Open Whisper Systems, the company that makes Signal, told the government it does not gather or keep the metadata that it sought under the subpoena – only the date and time an account is created and the date of the user’s last connection to Signal’s servers. The subpoena was accompanied by a gag order demanding Open Whisper Systems not publicly release any information about the subpoena. The subpoena was disclosed following a legal challenge by Open Whisper Systems and the American Civil Liberties Union. Meanwhile, Facebook has built a new layer of security into Facebook Messenger, that will allow users to more securely send messages between one another by selecting the “Secret” option when writing a new message. These messages will automatically vanish after a day (or less, if you choose). Mahsa Alimardani, Ellery Roberts Biddle, Weiping Li and Sarah Myers West contributed to this report.